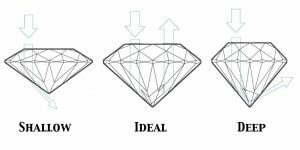 When choosing a diamond, there are four important factors to consider- the 4Cs; colour, cut, carat, and clarity. Each of these aspects affects the beauty of the diamond. Below are some tips for choosing the perfect diamond. When choosing a diamond, the stone of choice will be as near to colourless as possible. To the naked eye, it can sometimes be difficult to see much of a difference in colouring. As determined by the Gemmological Institute of America (GIA), the colour grading scale ranges from D (totally colourless) to Z (light yellow). A colour grading of F-H is optimum for maximum beauty. Perfectly clear diamonds with no fractures, scratches, or trace minerals are considered to be flawless and are the rarest in the world. The majority of diamonds found have some sort of natural flaw which can normally be seen through a jeweller’s 10x magnifying loupe. Flaws may not always be visible to the naked eye but can still have an effect on the brilliance of the diamond. The brilliance of a diamond is determined by its cut. A bad cut can take away from the beauty of even a near perfect stone in terms of colour and clarity. If a diamond is cut too deep, the diamond may appear dark and dull. Too shallow and light may be lost out the bottom – taking away from the brilliance. The carat is the measurement used to determine the weight of a diamond. One carat is equivalent to 200 milligrams (0.2 grams). It takes 142 carats to total one ounce. The size of a diamond plays a huge determining factor in the price of the stone- the larger the diamond, the more it will cost. This is due not only to the fact that it is larger but also due to the fact that larger diamonds are rarer and therefore carry a higher value. Coloured diamonds are rarer than traditional clear or white diamonds. These diamonds are available in a variety of colours and shades and can be set in any piece. Coloured diamonds are available in shades of gray, pink, green, orange, yellow, red, and brown and are priced based on the same criteria as white diamonds- the 4Cs. Diamond certification provides you with a document detailing the measurements of your diamond in each category of the 4Cs. Stones over 0.30ct, or 30 points, can be certified. 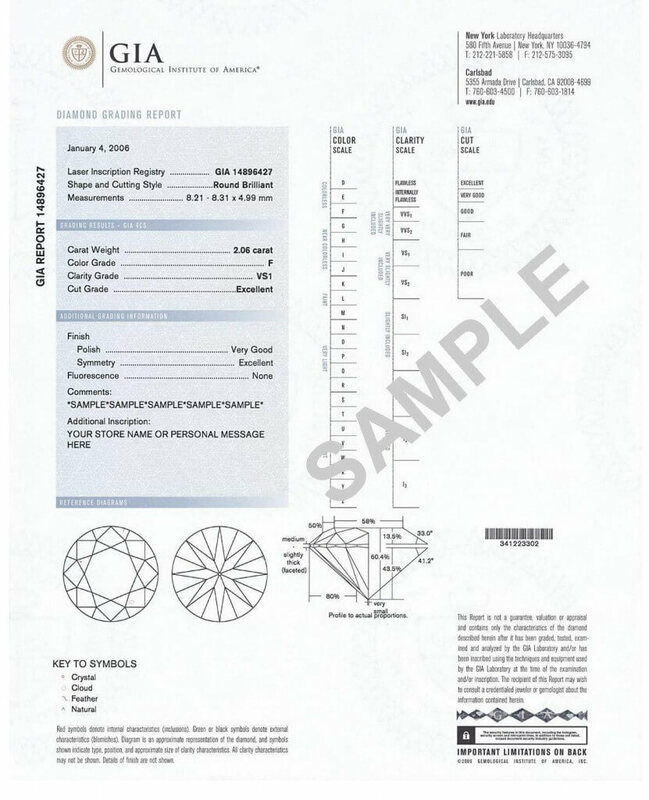 As can be seen in the sample certificate below, each diamond is measured for carat weight, cut, colour, and clarity thus giving you an accurate value of your diamond. We offer the following certifications: GIA, DCLA, EGL, IGI, HRD, ADR, and AUSCERT. For peace of mind, laser inscription protects you from fraud and shows proof of ownership of your individual diamond. A small laser inscription- unseen to the naked eye- is placed on your diamond giving it a unique identification number.